Trust & Love Bluthemes, among our customers are DesignrFix, Envato Studios & Pebble to name a few. We are all about the simple install and the simple features. 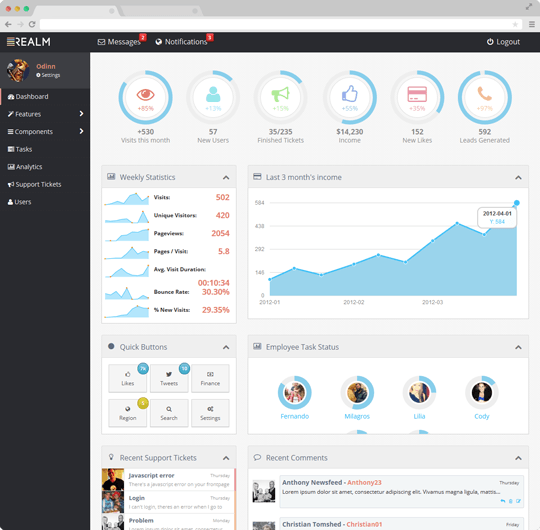 We try and make things very easy while still giving you the ability to customize the theme. You're not going to run into any frustrations over our themes not being updated to support the latest version of WordPress, we keep our themes up to date. We don't just say premium because it's a cool word, we mean it, there are a lot of themes out there, but few of them offer the significant customization Bluthemes do. 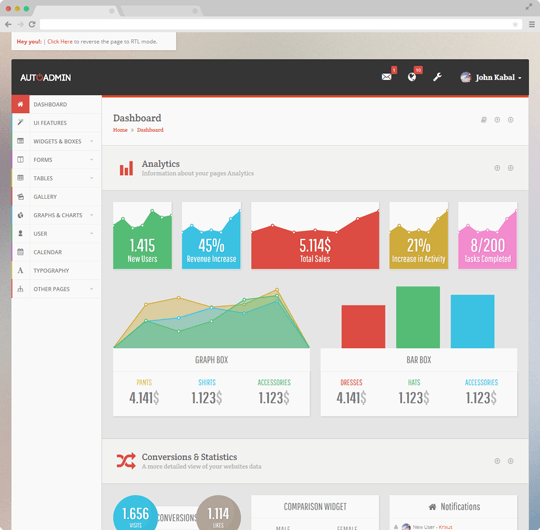 All our themes are responsive by design. Your readers should be able to take you with them whereever they go so we make sure everything looks good while they're at it. Supporting our customers has always been a big deal to us, if you get into any trouble with one of our themes, or just want to chit-chat, check out our Custom Made Support Forum. 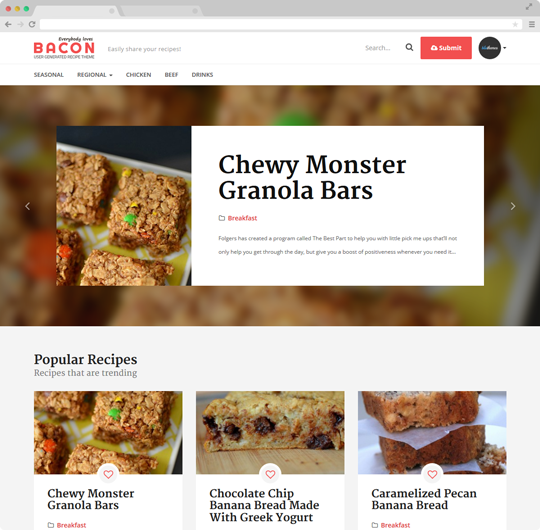 We have a great selection of WordPress Themes and HTML templates! loading... customers rated Bacon loading..
loading... customers rated July loading..
loading... customers rated Katla loading..
loading... customers rated Calypso loading..
loading... customers rated Opal loading..
loading... customers rated Litemag loading..
loading... customers rated Nano loading..
loading... customers rated Vivid loading..
loading... customers rated Breeze loading..
loading... customers rated Bliss loading..
loading... customers rated Keilir loading..
loading... customers rated Realm loading..
Not only is this one of the slickest WordPress themes around in terms of look and functionality, but the support is off the chart. I'm serious. I spent a few minutes browsing the support forum and the staff answers every single question, and the majority of the time ends up giving custom css codes to let the user know how to do what they're trying to accomplish. A great lesson in customer service. I hope this theme and its creators win a medal! Amazing customer support. They really help you out with customizing the theme. 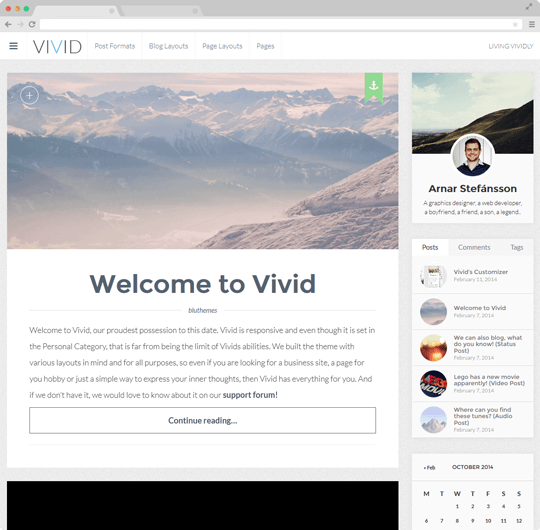 Such a great WordPress theme, very well designed with so many options to customize it...and all are very easy to use. Main reason for my 5 star rating is awesome customer support and design quality! Thank you so much! This is my first attempt EVER at creating a Blog Site & its not so bad! 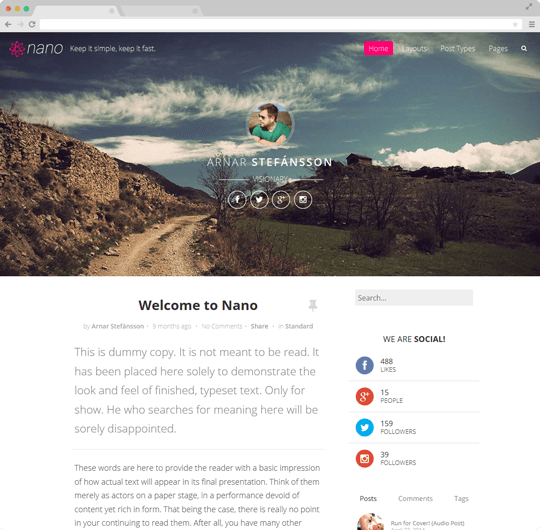 The designers at BluThemes created Nano quite user friendly for people like me. I found the Nano theme and purchased it bc of its simple clean look. 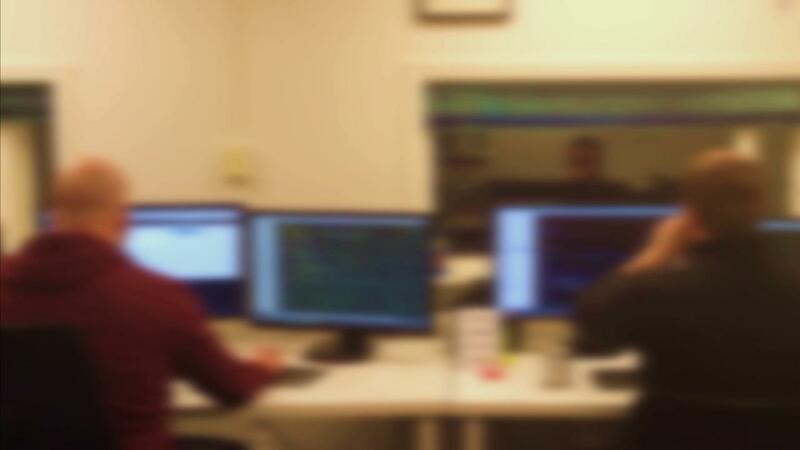 I was able to understand most programming on my own... then needed tech help. I sent a question online to BluThemes & received a working solution in less than 24 hours. They are very supportive & helpful! Great design group to work with. Will do anything to help you out. Will buy from again. 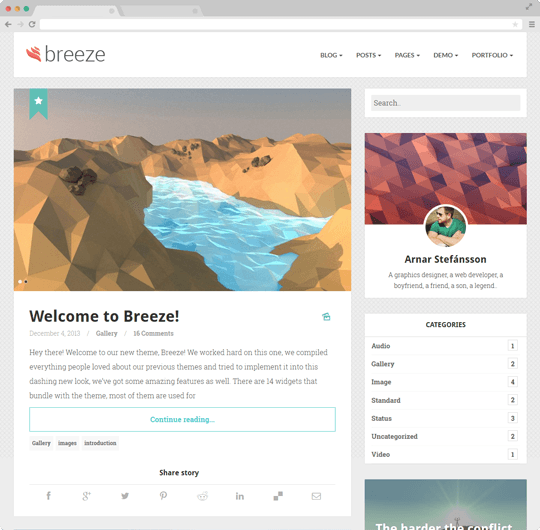 Just an all around great WordPress theme. Great for any blog. Support has been great with both themes. The guys at Bluthemes really seem to be passionate about making their customers happy. Anything I have needed to ask has been answered extremely quickly. The theme is well documented, well designed, and well supported. You can’t ask for more than that. 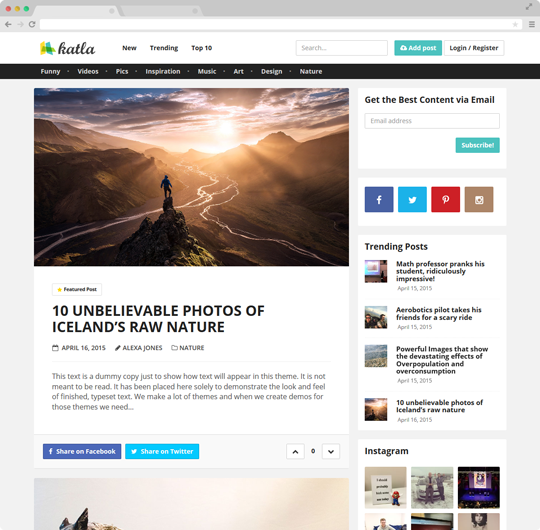 This is a fantastic WordPress theme, with amazing flexible options that have allowed me to use an entirely different colour scheme to the ones available. The "Theme Options" menu is very easy to navigate, and you can get yourself a look you really love that looks professional and works like a dream. I found myself with a few issues, but a quick post on the Blu Theme website's forum allowed me to fix those issues in double quick time thanks to the very helpful people at Blu Themes who made the themes. All in all, I very much recommend the theme and the designers, as they have done a fantastic job and they are super helpful to boot. 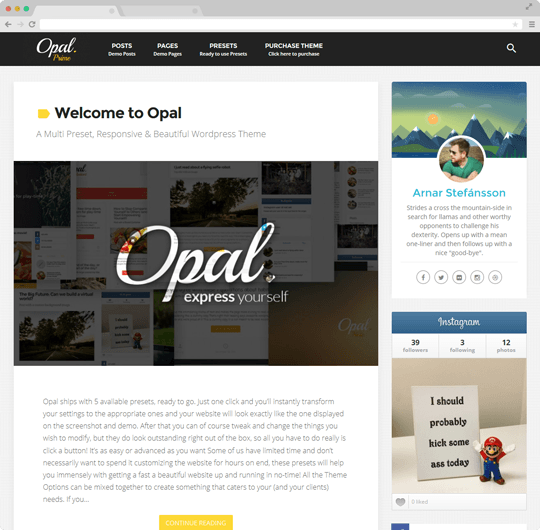 Fantastic looking WordPress theme with awesome customization options, and the customer support is outstanding! Five stars all the way! Fantastic theme with great customer service should you ever need guidance and or any tweeking!! Gorgeous theme, which I hope to use for a long time to go. Crisp, clean and beautiful to look at. Excellent support and excellent theme. Looks dynamite on my site. Great theme, good customizability and typography, quick support. We love the customisation options in this theme. 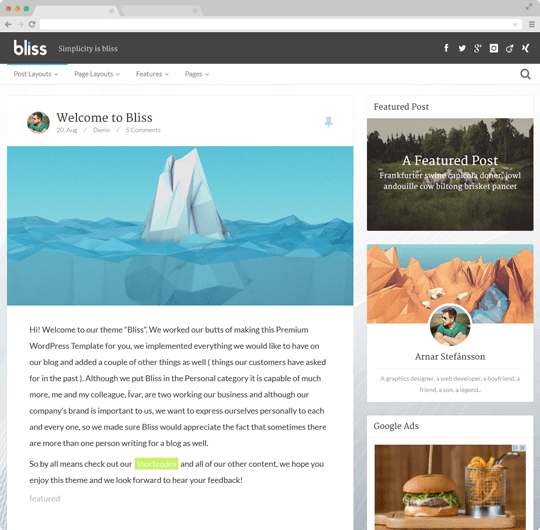 It's one of the best themes out there for blogging. 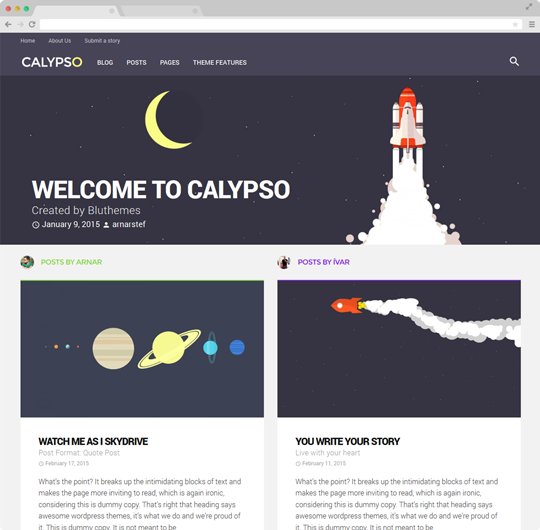 I love this WordPress theme. I love the design, I've received a ton of great feedback from others on how it looks, and it has been really easy to customize. Also, in the rare case that I do hit a snag, the support has been realy fast and really helpful. This theme installed without a hitch, was quick to set up and looks good. Very good. I'll be a repeat customer. I picked Keilir (of bluthemes_ lineup, because of the touches of color and post icons. I'm hoping to see more widgets and an improved live customization pane like their other themes. Then, 5 stars for sure. This se a great theme and I've gotten tremendous feedback over the new look and feel of my blog. I've also noticed the Keilir theme loads considerably faster than my old theme. 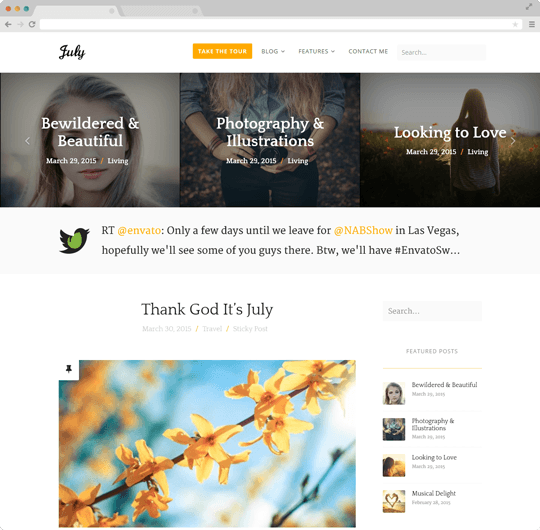 I've used so many WordPress themes, and this one is my fav. Everything I want, nothing I don't, and it's beautiful out of the gate. Perfect for personal blog. Pretty nice theme, I´ve been looking for ages to find something like this. Looks nice, simple, clean, modern... Perfect! Also the support the team provides is quite fast and always find a solution for you. Awesome support. Great options. If they got it. They keep it working! 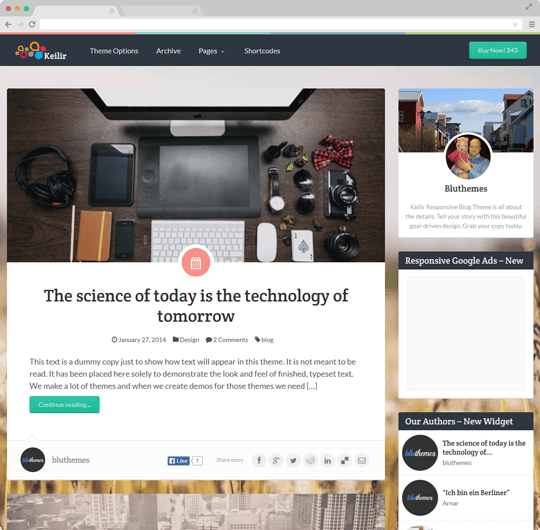 Thanks for the great WordPress theme!! In terms of attention to detail, this theme, apart from beautiful, zen and minimalistic, is top notch quality, as are all the other themes from these guys. Impressive and easy to set up. The theme fit seemlessly with our work--it could be made more or less complicated as we needed it to be. More than that, however, is the personal attention we received from Blu Themes. Arnar--your theme is epic and so are you. I will be a repeat customer of Blu themes without a doubt because of my customer support experience. 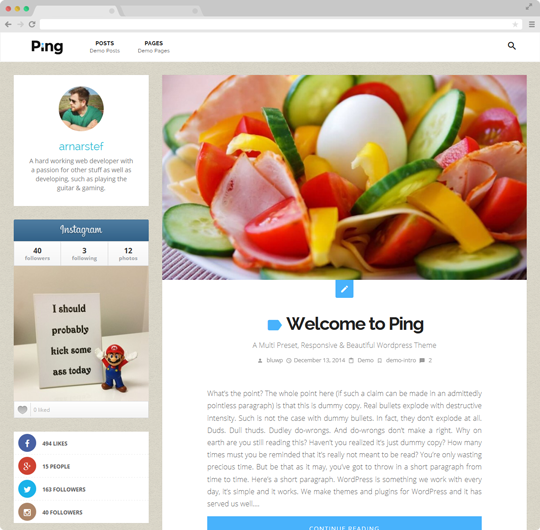 This theme is simple and clean, but with a lot of easy to use functionality. The developer has also been very responsive if there is the need. This is a beautiful theme that was dead simple to set up. I did not even have to rely on any of the documentation. Works great right out of the box. Highly recommend. The customer support is amazing and the theme is even better than that. I would highly recommend!